It’s hard to be all things to all people. There are just too many different desires to cater to. Common knowledge has it that, in attempting to do so, one winds up not pleasing anyone. 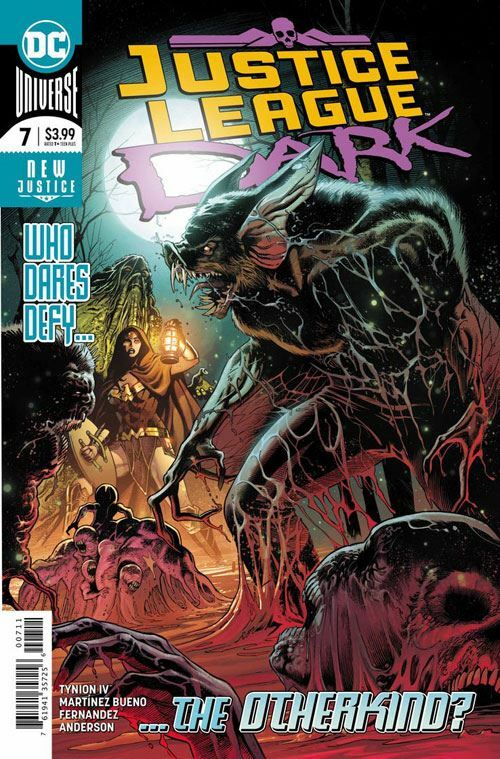 Well, clearly “common knowledge” has not been reading Justice League Dark. This issue takes a completely different tack, structuring itself like an old House of Mystery or House of Secrets issue, complete with a narrative host and four separate and distinct stories. And yet, at the same time, this remains a coherent issue of the team book, and advances the overall plot. Pretty darned impressive. Man-Bat gets to play the host. I am quite enjoying the scatterbrained scientist angle that Tynion is playing with the character. Zatanna has a meeting with Neron. Swamp Thing and Detective Chimp help out Andrew Bennett, of I…Vampire. Wonder Woman joins forces with Frankenstein and the agents of S.H.A.D.E. Zatara and Sargon the Sorceror have an otherworldly adventure. Lots of spookiness, and lots of fun throughout. Personally, I was really thrilled to see the agents of S.H.A.D.E. characters back. That was one of the few series from the New 52 that I really enjoyed. But that’s what Justice League Dark seems to be all about. Bringing back any and all of DC magical characters. No matter who your favourites are, it seems to be a safe bet that they will turn up in this book eventually. And once again, it’s Detective Chimp who gets the best lines, talking about how difficult it is to make a sentence using the moniker “I…Vampire,” and suggests Bennet start calling himself Vampireman. While I am finding Justice League Odyssey intriguing, and Justice League a heck of a lot of fun, both books are blown out of the water by Justice League Dark.